1031 Property Exchange for Excel provides the input and calculations in order to evaluation section 1031 tax deferred real estate exchanges. The template can evaluate 1031 exchange transactions with as many as four investors exchanging up to four properties each. 1031 Property Exchange for Excel can also analyze typical 3 legged exchanges, where one party acts as a middleman by buying the property that the exchanger wants to acquire and then swapping it to them. Evaluate boot given and received. Estimate the realized and recognized gains to calculate the transfer basis. Automatically create sample worksheets of IRS Form 8824. Perform "What if" analysis by changing the input assumptions. 1031 Property Exchange for Excel calculated reports clearly show property and transaction details and provide immediate analysis of whether the deal be structured to defer all or most of the gain. 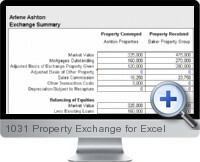 1031 Property Exchange for Excel provides detailed analysis for a wide range of calculations including mortgages, interest, boot, basis, net operating income, expenses, cap rate, improvements, depreciation, recognized gains, tax liability and much more.